Pictures 1—The Hawaiian Band taken in San Francisco in 1883. 2—The band on the steps of the new Palace and the Executive Building [Hale Mana Hooko] today, taken in 1884. The new uniforms of the boys seen in this picture was sent by mistake from America to Honduras, Central America. 3—The Band lead by [Jose S.] Libornio that refused to swear under the Provisional Government in 1893. 4—The picture of J. K. Pohina [James K. Pohina], the only man left of the 26 who established the band 50 years ago, who is still with the Hawaiian Band. 5—The band at the Golden Gate, of San Francisco, at a banquet in 1895. 6—The band today at their new home on Waiakamilo Street, Kalihi. 7—The Bana Hawaii leading the parade of the Great Secret Society Knights Templars in San Francisco, August 20, 1883. Royal Kawaihau Glee Club honors the Hawaiian Band, 1906. Just as was announced last week that the Kawaihau Glee Club would give presents to the children of the band boys, that Glee Club did indeed do so on this past Friday night at Progress Hall. There was a Christmas tree for the children with presents weighing down on its branches, which were given generously [for] the band members to see, things to give joy to their children; however, they were shocked by being each given envelopes with three dollars and sixty-five cents as a Christmas gift, something they did not bef0re dream of, that they too would receive Christmas presents. Ka Nupepa Kuokoa, Buke XLV, Helu 52, Aoao 1. Dekemaba 28, 1906. …forests of Oregon, and it was right in the middle of the room where the tree was stood, with strings of tinsel glistening and candles shining on the branches swaying with snowballs filled with candy; and because of the low light in the room, the beauty of the festooned tree was clearly seen. The Kawaihau Glee Club took their place atop the stage [awai], and there they opened with the song “Aloha oe,” and after they were done with that song, they played the “Kawaihau Waltz,” and that was when Santa Claus came in, that being O. Swain, and said that his sleigh was broken which was why the presents didn’t comewith him, but they were at the door, and some young singers brought the presents over to Santa Claus and he distributed them to the children and the room was just like a musical instrument shop with all the noise coming from the instruments of the children. Each of the children played trumpets like the Hawaiian Band (of Children). The most amazing thing that night was the handing over of envelops to each of the band members with a present within, and after the presents were done being handed out, Mr. Naone stood representing the members of the Hawaiian Band [Bana Hawaii] and gave their thanks to Sam Nainoa and his fellow members of the Glee Club for their honoring them; it wasn’t just something surprising for them, but something that gave them joy. Sam K. Nainoa responded from the Glee Club and was appreciative that what was planned went smoothly, and for him were given cheers of joy. There was also a light meal set out for the families of the band members, and they ate their fill of that food, and those that desired to dance, they went at it; were it not for the sleepy children the activities of the night would not have let out so quickly. Let it be recalled that the money used for this gift giving, that being the money that Mr. Nainoa and his Glee Club worked for by holding a dance at the Young Hotel to help the Hawaiian Band who was at Nevada. The profit from that activity was two hundred and thirty-one (231) dollars. Ka Nupepa Kuokoa, Buke XLV, Helu 52, Aoao 5. Dekemaba 28, 1906. 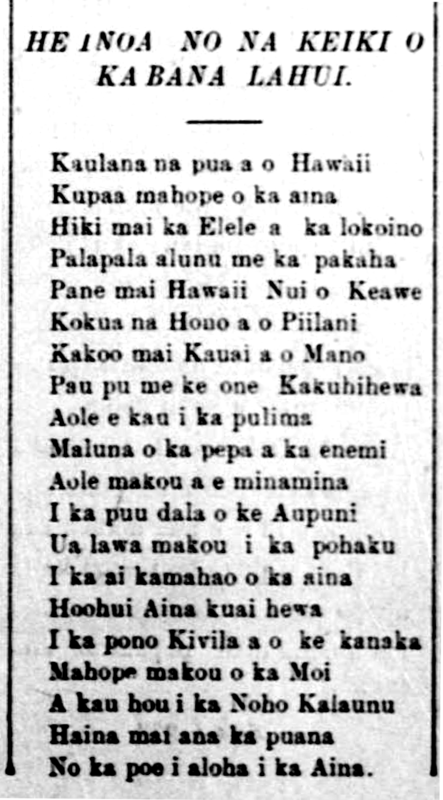 A name song for the boys of the Royal Hawaiian Band, 1893. HE INOA NO NA KEIKI O KA BANA LAHUI. 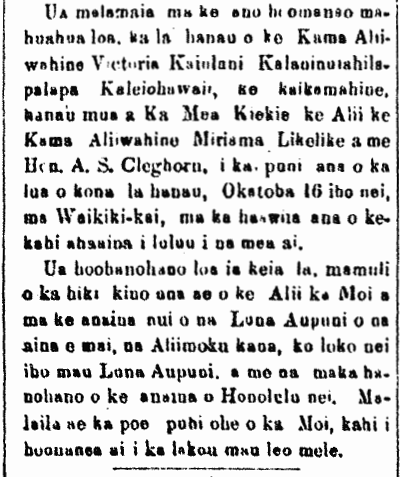 Hawaii Holomua, Buke III, Helu 185, Aoao 2. Maraki 23, 1893.